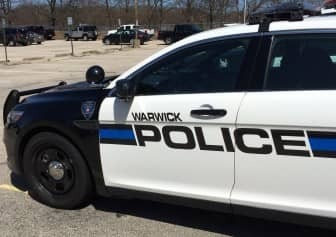 WARWICK, RI — Officer Bruce Law was posted at the intersection of Cowesett and Post Road when a car crashed into another stopped at the red light, leading him to arrest the offending driver on a DUI charge March 3 at 7:24 p.m.
her car into a nearby parking lot, Law reported. Law found the second car, a black 2014 Toyota Venza, driven by Isa F. Morales, 38, of 3595 Post Road, Apt. 11202, Warwick, about 250 ft. from the crash site, north on Post Road, according to the report. Law asked Morales for her license and about what had happened, and he noticed the driver’s eyes were bloodshot and the odor of alcohol became more intense, according to the report. Law asked Morales to perform a number of sobriety tests, which she submitted to, exhibiting a lack of smooth pursuit and involuntary movement in her vision, nearly fell over during a walk and turn test, and could not balance on one foot. Law arrested Morales on suspicion of driving under the influence of alcohol, and transported her to Warwick Police Headquarters, 99 Veterans Memorial Drive, where she registered a .259 and .253 on successive breath blood alcohol tests. Law arranged for Morales to be transported to Kent Hospital for evaluation for a welt on her head, and issued her a summons to Third District Court for the DUI charge. She was also issued a citation for failing to maintain proper intervals between vehicles.